A Victorian Gem!The exterior of this stunning house is a beautiful, romantic, Victorian fantasy, with columns, a turret and 10 Tiffany style stained glass windows. 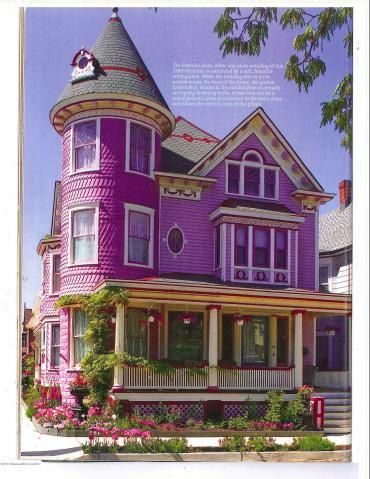 This elegant, historical landmark is on the cover of Gingerbread Gems book about Ocean Grove and was featured in Victorian Homes magazine and Monmouth County Magazine. This 7 bedroom 3.5 bath house offers aesthetic appeal and modern upgrades. Total luxurious renovation inside and out: new electric and plumbing; all new kitchen with painted tin ceiling, new bathrooms with jacuzzi, steam shower, marble, radiant heated floor and surrounds; refinished original wood floors; 4 porches, bonus rooms to use as offices, third floor deck and great room; generator, and snow-melt sidewalk. Glorious English garden is spectacular! The exterior of the house is a beautiful, romantic Victorian fantasy that has been widely photographed. Front and side porches with all weather curtains and awnings create delightful outdoor rooms where compliments from passersby can be overheard. The spectacular, low maintenance perennial English garden dramatically enhances and complements the house's colors and architectural themes. The garden was included in several garden tours and has been frequently photographed and painted. The interior of this light-filled, spacious house offers both aesthetic appeal and myriad upgraded conveniences for comfortable modern living. The all new kitchen has large center island, a second food preparation sink, a commercial gas range, and a stunning custom painted tin ceiling. There is all new plumbing and electric systems, central air, Jacuzzi tub, steam shower, continual circulating hot water, refinished original wooden floors, radiant heat floors in 2 bathrooms, a generator and a snow-melt sidewalk. The front hall features an Austrian crystal chandelier, marbleized fluted columns with gold leaf. The living room windows and alcove also have gold leaf applied to the trim. Chandeliers illuminate 3 floors of turret rooms. The 3rd floor turret room is open to the full 17 foot height of the turret. In addition to the 6 bedrooms, there are bonus rooms to use as offices or hobby rooms. The third floor, with 3 bedrooms, full bath and a light-filled great room with kitchenette can provide convenient guest quarters or an in law suite. First floor porches have custom all-weather curtains that create charming outdoor rooms. The kitchen porch is a delightful place to enjoy summer meals. The front porch overlooks a beautifully landscaped triangle park with a huge urn and flowering perennials that complement the colors of the house.